This is our all in one wreath, the Bordeaux Vignoble Holiday Wreath. A lovely gift for the wine lover in your family. Do you desire a wreath that takes you from the fall season right through the New Year Holidays? This understated festive wreath evokes the fond thoughts of a harvesting grapes in french wine country, mingled with lush blueberries, yet at the same time the silver sparkle suggests the excitement of the holiday season right around the corner! All in one! 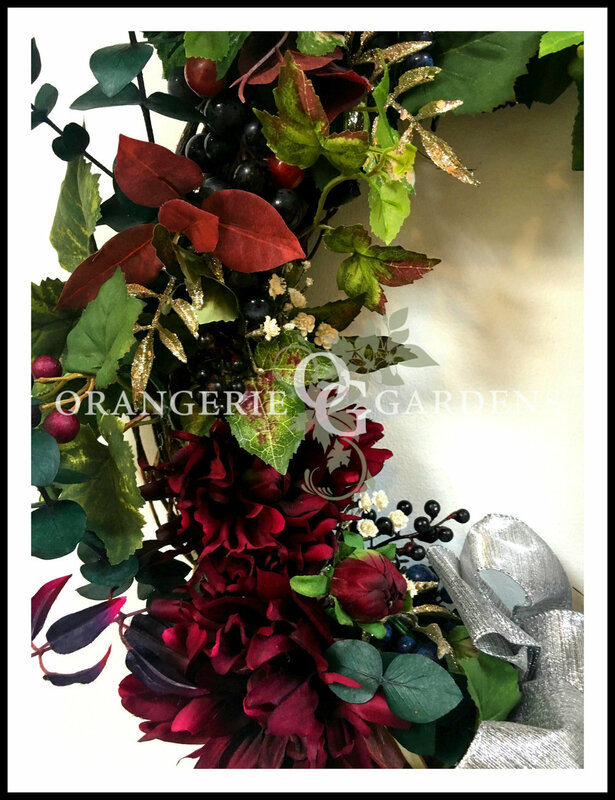 Lovely Grapevine Wreath, Grapes, blueberries, Burgundy dahlias and Hydrangeas, grape vine leaves, red fall foliage, Silver glittered ferns, Silver bow. Measures approximately 22" wide by 22" high by 6" deep.